Simpson Nomex Head Socks add an extra layer of protection under your helmet while protecting and covering the open and vulnerable neck area under your helmet and above your jacket. 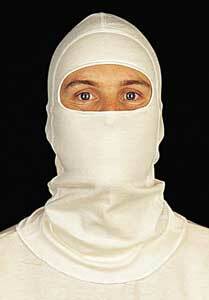 Knitted from extra-plush Nomex for comfort and to help wick away moisture from your skin. 23000W is rated 5.0 out of 5 by 1. Rated 5 out of 5 by Steve L from best fit I have purchased all kinds of different head socks, and this one by far , hands down the most comfortable to wear( although on the pricey side) and provides the best neck protection by having enough fabric to tuck down into the neckline of my race suit.